Giovanni Frangi is born in Milan 1959. Lives and works in Milan. In 1983 :Gallery La Bussola, in Turin, his first solo show. Frangi has exhibited widely, both in Italy and abroad. He was awarded the Chamber of Deputies Prize in 1996 at the XII Rome Quadriennale which consists in being invited in Montecitorio, the lower house of the Italian Parliament, the year after receiving the award. In 1999 an exhibition dedicated to him was held at Galleria del Credito Valtellinese in the Refertorio delle stelline, in Milan, which featured a selection of works based on woodland life, introduced in the catalogue by Giovanni Agosti. 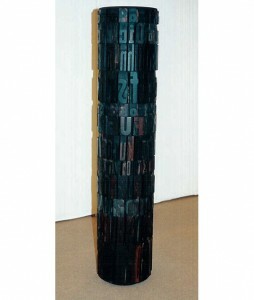 In 2000: solo exhibition entitled Giovanni Frangi – viaggio in Italia at Galleria dello Scudo, in Verone, and followed this up with the Giovanni Frangi – Sculture, una mostra per l’estate at Laurence Rubin Gallery, Milan, an exhibition displaying exclusively large-scale works on paper and including an imposing sculpture placed in the garden, entitled Fiordifragola. In 2004 Frangi devised Nobu at Elba for the Stables of Villa Menafoglio Litta Panza, in Biumo Superiore, in the outskirts of Varese. This installation comprises four large painted canvases, covering the area of 40 sq m overall, and some twenty sculptures made of burnt foam rubber, onto which a light is trained at regulars intervals, with the aim of eliciting an emotion similar to what one feels near the stream at night in an uninhabited area. In 2005 he brought Giovanni Frangi- Ti ci porto to Bolzano, where it was put on at Les Chanses de l’Art, while in 2006 Poggiali e Forconi, in Florence, hosted View Master, a natural diorama made of foam rubber divided into two parts which can only be seen through small holes, revealing the bottom of the sea on one side and the thaw on the other. The same work was later reassembled at Promotrice delle Belle Arti, in Turin, as part of the Senza Famiglia exhibition.